President Muhammadu Buhari will on Thursday (today) inaugurate Justice Walter Onnoghen as the acting Chief Justice of Nigeria, The PUNCH has learnt. The decision to inaugurate a CJN in acting capacity, it was learnt on Wednesday, was to avoid a vacuum in the judiciary as the incumbent, Justice Mahmud Mohammed, attains the mandatory 70 years retirement age. The PUNCH learnt that the acting CJN would be inaugurated at about 2pm inside the Council Chambers of the Presidential Villa, Abuja. 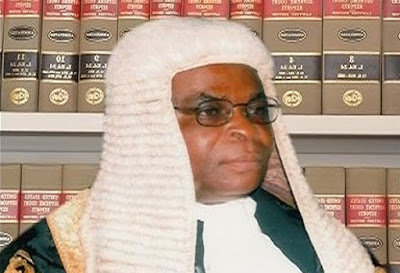 Justice Onnoghen is the most senior Justice of the Supreme Court after Mohammed. The National Judicial Council was said to have earlier forwarded the name of Justice Onnoghen along two others for the President to pick any of the three justices as the new CJN based on the recommendations of the Federal Judicial Service Commission. As of the time of filing this report, the President had not sent such communication to the Senate, raising fears that there would be a vacuum in the leadership of the judiciary from Thursday. But a competent source confirmed to one of our correspondents that an acting CJN would be inaugurated on Thursday, but refused to name any of the justices who the President had picked. “An acting CJN will be sworn in by President Muhammadu Buhari at 2pm tomorrow (Thursday),” he said. When asked further who the person was, the source advised The PUNCH to get across to the Attorney General of the Federation, Abubakar Malami (SAN), on the issue. It will also be the first time in the history of Nigeria that a person will be appointed to the office of the CJN in acting capacity. Those whose names were forwarded to the NJC were said to be Justice Onnoghen, Justice Tanko Muhammad and Justice Suleiman Galadima. Onnoghen, who is the most favoured by the tradition of succession arrangement in the judiciary, being the next in rank to the outgoing CJN, was picked by the NJC and his name forwarded to the President. The valedictory court session to be held in honour of Justice Mohammed is scheduled to hold at the Supreme Court complex at 10am on Thursday (Thursday). Another source, who opted to be more specific, told one of our correspondents that the President opted to swear in Onnoghen in acting capacity in order to prevent a vacuum in the office of the CJN pending when he would decide whether or not to confirm the CJN-nominee in substantive capacity. Under the Constitution, a person can only hold the office of the CJN in acting capacity for three months. Sources told one of our correspondents that the decision of the President might be connected with an ongoing investigation by security agencies into some allegations involving some Justices of the Supreme Court. Justice Onnoghen was born in 1950 at Okurike, Biase Local Government Area of Cross Rivers State and was appointed to the Supreme Court bench in 2005. Though section 231(1) of the 1999 Constitution, as amended, confers on the President the power to appoint a CJN on the recommendations of the NJC, it, however, stressed that such appointment must be subject to the confirmation by the Senate. If Buhari approves Onnoghen as the 17th CJN, he will become the first jurist from the southern part of the country to head the judiciary in about 29 years. Onnoghen will clock 70 on December 20, 2020. Justice Ayo Gabriel Irikefe, who retired in 1987, was the last CJN from the south of the country.